From roadside, this listing does not show its full potential. A showing will reveal the true value of Crown Terrace 22. The caracter of this villa is enhanced due to the open floor plan and the beautiful vistas from the living room, kitchen and covered terrace. The villa with the high ceiling, tropical hard wood floors and wide folding doors reflects the ambiance of a beach villa however this one is ideally positioned up on the hills of Sabadeco Crown Terrace. 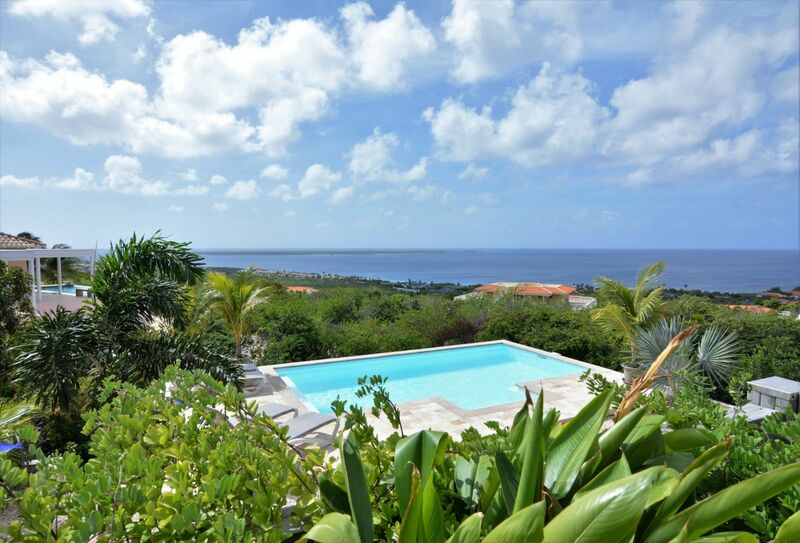 Your views is over the residential area, the greenzone, The Western shoreline of Bonaire, Klein Bonaire and the Caribbean Sea. The terrace of the villa holds a private pool. The sun terrace, located a few steps lower, features a 2nd pool that can be used by your friends or guests staying in one of the two guest houses. Garden: landscaped with a mix of plants, trees, white gravel stones with on site parking. The garden is partially left untouched to blend in with the natural vegetation. Villa: entrance using the covered terrace into living room with open concept kitchen (both with doors opening to covered terrace with pool), hall to master bedroom (access to covered terrace) with ensuite bathroom, 2nd bedroom, 2nd bathroom, 3rd bedroom, storage/laundry room. Guesthouses: entrance using covered terrace into living room with kitchen, bedroom with ensuite bathroom. Exterior lights on day/night sensor. Rinse facility and storage for dive/snorkel gear. Registered at the Land Registry Office Kadaster, number 4-A-1961.